There are few things in my life that have influenced me more than Godzilla. Over the years, they've been there for me. On rainy days, on sunny days, on Thanksgivings and Turkey Days and on days when I just needed a pick me up. Even more recently, the movies have been there for me and my daughter to watch and to bond over. Of course, besides the titular character, there was another link--Haruo Nakajima, the man inside the suit and the original Godzilla actor. Here was a man who did more than just act, t hough. He brought monsters to life, wearing suits that weighed a ton and were damn uncomfortable and hot to boot. But he wore them proudly and as such, was considered the best Godzilla suit actor by many, including myself, but most importantly, by the other people he worked with making the films like special effects director Eiji Tsuburaya. Thus, it is no surprise that the latter tapped Nakajima to work playing monsters in Tsuburaya Productions own series, Ultraman and Ultraseven. In total, he played Godzilla 12 times and numerous other monsters throughout his career. Several years ago, I got the rare chance to meet this legend. It was at the Chiller Theatre convention in Parsippany where he was appearing with two other suit actors, Kenpachiro Satsuma and Tsutomu Kitagawa. The line was long and the wait equally so, but it was worth it to talk to Mr. Nakajima for a few minutes and tell him how much joy his pictures had brought to people. 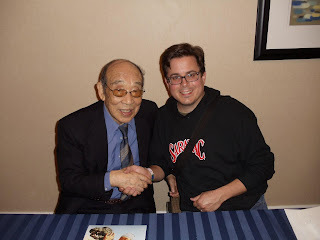 He thanked me and we posed for a picture and then I moved on while he continued to greet fans with an energy and enthusiasm for the rest of the day that I can only hope to have when I am in my later years. It is a legacy of fantastic monster films that Haruo Nakajima leaves us and the memory of a kind and wonderful man. Watch these movies and celebrate the life of the King of the Monsters himself.